discover... BOONE COUNTY PUBLIC LIBRARY APRIL 2019 L Boone County Public Library BCP Discover Boone County Public Library . . .because your history can be found here. 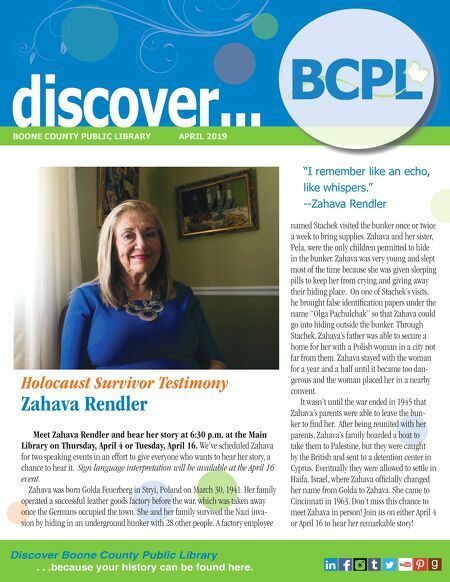 Meet Zahava Rendler and hear her story at 6:30 p.m. at the Main Library on Thursday, April 4 or Tuesday, April 16. We've scheduled Zahava for two speaking events in an effort to give everyone who wants to hear her story, a chance to hear it. Sign language interpretation will be available at the April 16 event. Zahava was born Golda Feuerberg in Stryi, Poland on March 30, 1941. Her family operated a successful leather goods factory before the war, which was taken away once the Germans occupied the town. She and her family survived the Nazi inva- sion by hiding in an underground bunker with 28 other people. A factory employee Holocaust Survivor Testimony Zahava Rendler "I remember like an echo, like whispers." --Zahava Rendler named Stachek visited the bunker once or twice a week to bring supplies. Zahava and her sister, Pela, were the only children permitted to hide in the bunker. Zahava was very young and slept most of the time because she was given sleeping pills to keep her from crying and giving away their hiding place. On one of Stachek's visits, he brought false identification papers under the name "Olga Pachulchak" so that Zahava could go into hiding outside the bunker. Through Stachek, Zahava's father was able to secure a home for her with a Polish woman in a city not far from them. Zahava stayed with the woman for a year and a half until it became too dan- gerous and the woman placed her in a nearby convent. It wasn't until the war ended in 1945 that Zahava's parents were able to leave the bun- ker to find her. After being reunited with her parents, Zahava's family boarded a boat to take them to Palestine, but they were caught by the British and sent to a detention center in Cyprus. Eventually they were allowed to settle in Haifa, Israel, where Zahava officially changed her name from Golda to Zahava. She came to Cincinnati in 1963. Don't miss this chance to meet Zahava in person! Join us on either April 4 or April 16 to hear her remarkable story!